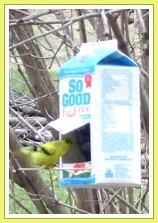 How to turn a milk carton into bird feeder. Here’s how to recycle a milk carton or juice carton to make an excellent bird feeder for finches, sparrows, chickadees and other small feathered visitors to backyard bird feeders. This design protects the bird seed from rain and snow, which is very useful in the winter months when many bird feed platforms become snow covered and unusable. Don’t forget, however, that feeding the birds is a year-long commitment; during the nesting season in spring and summer, the nutritional needs of many birds increases tremendously as they work to build nests and feed their young.